Most of my blog’s readers know this, I am German, but grew up in Germany the US and France. Still Christmas stayed a completely German affair. Not all parts of Germany are very Christmassy, nor are all Germans Christians. Still Christmas is important. Today, I want to share some of my traditions for the 24th of December, or Heiligabend (Holy Evening). 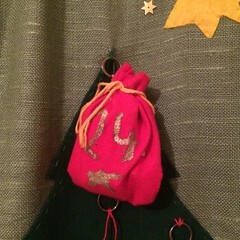 The 24th of December starts with the opening of the last bag, window or door of the advent calendar. Because Christmas is almost here! Actually celebrations happen on the 24th rather than on the 25th. Today things are different for many Children in Germany, because most will be banned from the living room for most of the day. In the living room, one can hear parents or grandparents (the number of adults allowed inside is often limited, at least in my family, to preserve the magic) rummaging around as they are transforming it into a magical place. Many kids will at one point in their life try to get a look through the keyhole or if the door is made out of glass through the makeshift curtains. Are the mountains of presents big? Where are my presents? But quickly this nosiness will be taken over by a feeling of guilt, hoping that no one saw. I recall that one year I threw a look through the keyhole and all I could see were presents hidden underneath tea towels, I guess I was in the age of curiosity and my parents knew it. The 24th must be the slowest day of the year for kids, and the quickest for adults. It drags on, and even though it is right after the winter solstice it seems as though night does not want to fall. The Christmases with snow make the wait so much easier, as one can go sleighing, build a snowman or just have fun outside. It’s also the moment for those last minute presents and creation of window decorations. One year when celebrating with my grandfather, we went to a church outside of Jena that was lost within a field. There was no heating, there was no electricity, and the candles were the givers of light. It was a beautiful Christ Mass in a place were one could sense the whole magic and simplicity of Christmas. After Church, everyone makes their way home. Kids’ eyes are gleaming with the anticipation of the arrival of the Christkind. With my parents we normally settle down for some tea and Christstollen while waiting for the Christkind. So who is the Christkind? Well it is a little Christ child; just imagine a little child that goes from house to house every Christmas Eve and that says “it’s time!” For me it is the spirit of Christmas. I realised rather quickly that my mother would often leave to go to the toilet while my father was reading “Scrooge”, as we lovingly call A Christmas Carol by Charles Dickens (this is one of my favourite traditions, and last year I received my own copy in German with beautiful illustrations by Lisbeth Zwerger to perpetuate the tradition). While my mother was away a bell would suddenly ring from the living room. The bell belonging to the family but used only by the Christkind. Once the bell has been rung, it is time to discover the Christmas tree. Can you imagine the magical moment? The children in the house, and some adults too will now see the tree fully decorated and lit in most cases by real candles. There will be a nativity scene and sometimes a Christmas Carousel. Other decorations that aren’t attached to the tree might include a little man smoking a pipe (he really smokes), and the Bergmann and the Bergmann Engel, a miner and a miner’s angel each one holding two candles. These are figurines from East Germany, I am sure that that’s where the true North Pole is located, at least it’s were so many decorations and Christmas treats are produced. All this, is magic, for everyone, at any age. This year, I’ll be witnessing my daughter discovering the tree. And I am sure that all of our hearts will be filled even more so by the magic of Christmas. It’s time to sing a few songs, depending on the musicality of the family of course. Sometimes children will recite a Christmas poem and then it is finally time for the presents. After the presents it’s time for phone calls to the family members not present. And then before the level of sugar in the blood has risen to too dangerous levels due to all the chocolates and cookies, it is time for dinner. The Christmas Eve dinner will often be simple, as the real feasts will take place on the 25th and 26th, the first two days of Christmas. But not all my Christmases were as described. While living in the US, there were no real candles on the tree, it was too thick, and my parents did not dare do it, so electric lights had to fill that gap. We had years in which we attached stockings to the chimney. Not every year we go to church. Sometimes we do, sometimes we don’t. My second Christmas Eve being together with S was spent with his parents, it was the first time away from home. 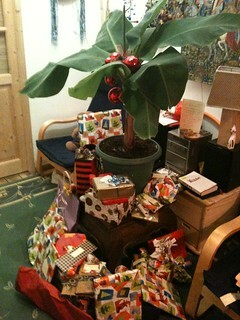 The Tannenbaum was replaced by a banana tree, which probably is closer to the type of tree that was around for Jesus’ birth. So I hope that you will find peace and quiet over the next few days, that you will spend some precious moments with your loved ones, and that you will feel the magic of Christmas! I want to thank all of the 21 participants of the Advent Calendar, and invite you to read their contributions, discover their blogs, books and music and make new connections! Thank you! Next Merry Christmas! Fröhliche Weihnachten! Joyeux Noël! I think there’s a lot to be said for the tree making its debut on Christmas Eve and not at the end of Novemember as it often seems to! A lovely piece to end a lovely series. Congratulations and thanks for running it. Have a great Christmas. Thank you Anabel. When I moved to the US as a kid (I was 12) I was experiencing a major culture shock, I had never actually seen trees that were put up early, besides those in schools and public places. I hope that you had a great Christmas! Thank you for having joined in the series yourself. I do hope that you have found many new blogs to read, as well as many new readers. We had a lovely day, thanks Solveig. Thank you! I hope that you had a great Christmas. As it’s the third day of Christmas, let me wish you a Merry Christmas too! I loved the candlelit church in Jena… Enjoy your little girl, Christmas is always so much more fun with kids! Joyeux Noel! It is a celebration for kids, as they sense the magic that’s in the air. i have the feeling that families where there are always kids around have kept closer to the spirit of Christmas. Merry Christmas, Solveig! This has been a great series, thanks for hosting it! Thank you Trent! I hope you had a great Christmas and still have a great Christmas. Merry Christmas. Thank you for having been part of it with your beautiful story. Solveig, I enjoyed learning about your Christmases and those traditions and memories of the others. What a wonderful series and an amazing gift you have given all of us by creating and hosting it. Your family has a very lovely Christmas tradition. My parents didn’t put the presents under our tree until we went to bed Christmas Eve, so in the morning we would dash to see what Santa brought us. Sometimes, I awoke in the middle of the night in the attempt to catch Santa, but he had already come. I enjoyed your story and wish you and your family a VERY MERRY CHRISTMAS! Thank you for organizing and hosting all of the posts for Christmas! I enjoyed the ones I got to read and will spend some time reading the ones I didn’t get to. Thank you Corina, I am glad that you joined the series with your legend. Merry Christmas to you too, and happy late Birthday! (I did not spend any time on the internet the 25th). Merry Christmas, Solveig, to you and your family. It will be so nice to see your little girl discovering the tree and the traditions of your family … and a little of her father’s! Thank you for creating this Advent Calendar, inviting us to participate, and hosting it. It has been a treat. We made new people, exchanfed memories and traditins – and all in the spirit of Christmas. Thank you Camille. I am so glad that you joined the Calendar with your contribution. I hope that you found many blogs to read as well as many new readers to your own bog. After reading the first few entries on your calendar, I am now reading them in reverse order, which is interesting. 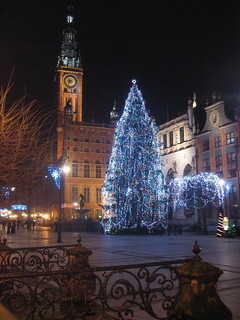 I am really enjoying it and I loved the stunning photo of Christmas in Danzig, Poland. Beautiful! I came very close to experiencing a German Christmas back in 1992 but I felt a very strong call to go home for Christmas and didn’t go back. Part of me actually wanted to live in Germany but once I arrived home, I couldn’t go back. Enjoy reading the little Calendar stories. I will get back to your questions regarding Sankt Nikolaus soon, I am trying to catch up with comments, and reading (I was a bit inactive over the Christmas days, and hosting a series is actually more demanding than I thought). Congratulations and thank you! I do hope that the others who participated will do as you did, and read and leave comments. Thank you so much. Well, I sat down this morning and put together an overview post, linking to 24 posts is not fun either, I should have done it as we went. Today was meant to be for a guest, someone had come forward and asked that I reserve the 10th of December in the Calendar for their contribution. Sadly the contribution has not arrived. Thus I am improvising and providing a link to one of the Advent Posts I wrote for last year’s calendar. (if you are interested in contributing, there are still dates to be filled, just drop me a line).